Owen Clark was born in the fourth quarter of 1878 in Wakefield, West Riding in Yorkshire to railway guard and librarian Mason Clark and Sarah Clark nee Phillips. 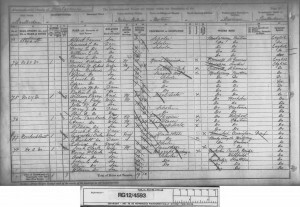 Owen’s father Mason Clark was born about 1853 in Stretham, Cambridgeshire to Matthew Clark. Owen’s mother Sarah Phillips was born about 1852 in Newtown, Montgomeryshire in North Wales to Evan Phillips. 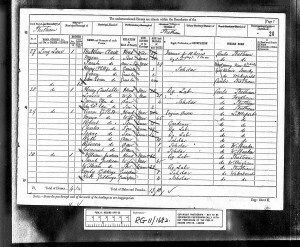 Mason Clark and Sarah Phillips married on the 10th of May 1876 in Grange, near Cartmel, in Lancashire. Owen Clark was born in the fourth quarter of 1878 in Wakefield and was baptised on the 13th of March 1879 at St Catherine’s in Sandal. Owen’s father Mason was working as a railway guard. Owen Clark had 5 siblings: Harry Phillip Clark, John Evan Clark, Oliver Clark, William Clark and Minnie Clark. At the time of the 1881 Census, the family lived with Mason’s father Matthew Clark at Long Lane, Stretham in Cambridgeshire. Matthew was a farmer who owned 10 acres of land and employed one man. Mason was working as an agricultural labourer and Sarah was looking after their children Harry Phillip Clark, John Evan Clark and Owen Clark. 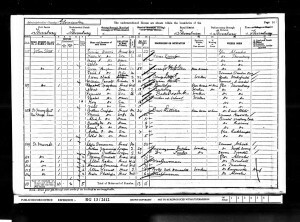 During the time of the 1891 Census, the family moved to Rowlands Court, Bryn Street, Newtown, Montgomeryshire, Llanllwchaiarn. Owen’s mother Sarah Clark was working as a seamstress, his brother Harry Phillip Clark as a telegraph messenger and Owen Clark, John Evan Clark, Oliver Clark, William Clark and Minnie Clark were at school. 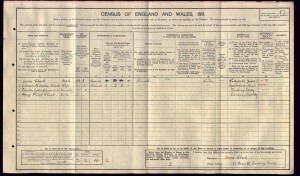 At the time of the 1901 Census, Owen became a boarder to carriage proprietor George Hughes living at John Street in Thornbury, Gloucestershire. Owen was working as a printer compositor. 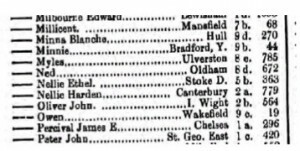 Owen Clark got married by Banns on the 18th of January 1908 to Elizabeth Amelia George at St Martin’s church in Dorking. At the time of the marriage, the couple lived at 36 Rothes Road in Dorking. Owen’s father Mason Clark was working as a librarian and Owen as a printer and a journey man. Elizabeth Amelia George was born about 1880 in Sydenham, Kent, to gardener John George and Emma E. George. At the time of the 1911 Census, the family lived at 37 Dene Street in Dorking. Owen was working as a printer and Elizabeth Amelia was looking after their children Dorothy Lydia Minnie Clark and Harry Philip Clark. The accommodation had 3 rooms. Owen Clark was well known in Dorking. He worked for Mr W. G. Boorer and afterwards for Messer’s Rowe. Owen was also a good and sought after vocalist. For several years he was a member of St Martin’s choir and of the Dorking choral society. As a ‘privileged’ Oddfellow he had passed through its offices and was also a member of the Hospital Saturday Committee. 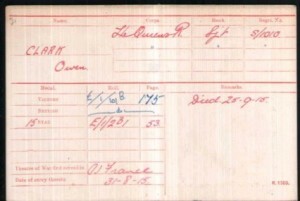 Owen Clark enlisted in October 1914 in Guildford. At this time the family still resided at 37 Dene Street. He became Sergeant of the D Company, the 8th Battalion of the Queen’s Royal West Surrey Regiment. His regimental number was S/1010. He disembarked on the 31st of August 1915 to France. 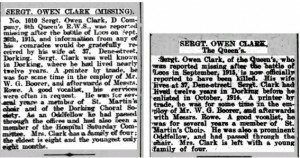 According to the 1916 Dorking and Leatherhead Advertiser, Owen Clark was reported missing after the Battle of Loose on the 26th of September 1915. 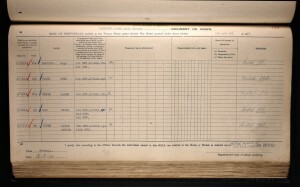 By 1917 he was reported to be killed on or since the 25th of September 1915. At this time his wife still resided at 37 Dene Street in Dorking. She later moved to 36 Rothes Road. 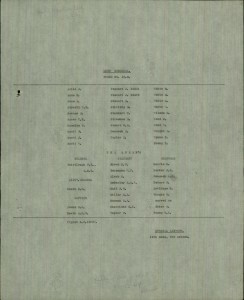 Owen Clark is commemorated at the Loos Memorial in France on panels 13 to 15. His wife Elizabeth Amelia Clark received £6 on the 9th of December 1919 in Soldier’s Effects. Owen Clark lived in Dorking for nearly 12 years and left behind 4 children all born in Dorking; Dorothy Lydia Minnie Clark, born in the 2nd quarter of 1908; Harry Philip Clark, born in the 1st quarter of 1910; Oliver W. Clark, born in the 4th quarter of 1911; and May Clark, born in the 2nd quarter of 1915. The youngest, May Clark, was only 8 months old in February 1916. 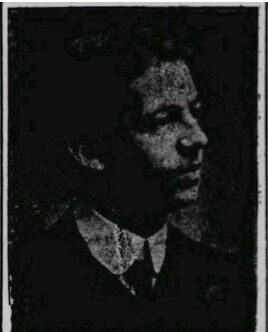 Owen Clark was awarded the British War and Victory medals and the 1915 Star.